For many kids, the back to school season is a joyous experience. Hand in hand with your parent, picking out the perfect backpack, sharpened pencils and a notebook that you will fill with all your new knowledge. But, the school year doesn't start the same for every child. Many children fear both that first day of school and every day there after because there is no backpack, pencils or notebook for learning. As the cost of annual back to school supplies increase, many families cannot afford to buy the ever growing lists of must haves. If a family is faced with a choice of food on the table or back to school supplies, the situation is dire. Again this year many writers and bloggers are joining forces with Classroom Direct for the #GivingBackPacks program. 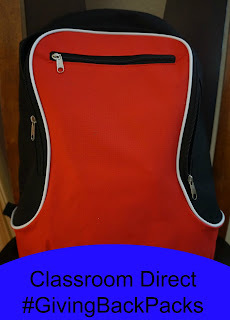 Classroom Direct is an online store that provides Pre-K through 8th grade back to school and classroom supplies at budget friendly prices. From the rainbow colored box of crayons to the sketch book for those artistic creations, Classroom Direct has all the necessary supplies for the classroom. The online shopping allows parents to complete the back to school shopping list in one setting. Mom can shop after the kids go to bed late at night and have the supplies arrive on her door step. Sections like the Classroom Packs on the Classroom Direct website can take the guess work out of shopping too. The convenience and price helps make back to school shopping a little less stressful on a family. As my children head back to school, I think back to the days when their backpacks were almost as big as themselves. Those days of early learning set the stage for the young men that they are becoming. From giving themselves a strong sense of self-esteem to developing an inquisitive desire to learn, these many attributes came from their early learning environment. Luckily, we were fortunate to have an early education center that provided a nurturing environment for my children. My children were exposed to a variety of intellectual and emotional learning at an impressionable age. The balance of book knowledge and personal development was essential to their growth. From learning to be kind to others to reading a book, every piece of the puzzle lead to the little men that they are today. The purpose of the GivingBackPacks program is to assist either a program or a child in need. This year, our family is choosing to give our backpack to Noah Ark's Preschool, at St. Paul's Presbyterian Church. My in-laws are members of this church and the community has provided loving support to them. The church's pre-school program assists children in the community in both their educational and emotional development. I appreciate Noah Ark's programming because the education extends beyond books. The curriculum combines school readiness with relationship skills and even healthy lifestyle choices. The program sees these young children as future citizens who will lead our community to a better place. Some of the children come from disadvantaged homes. The donation of the Giving Back Pack will help the school provide many items for the children in the program. Just a few hours a day in a supportive, caring environment can make a difference in these children's lives. While these topics are prevalent during the back to school season, my hope is that the ideals of the #GivingBackPack project provided by Classroom Direct isn't forgotten by the time that Halloween passes. Over the process of a school year, classrooms run low on supplies. Teachers, families and schools, who didn't have the funds at the beginning of the year, probably don't have the fund to buy new supplies later in the year as well. If your family is able, consider buying an extra pack of pencils, container of crayons, or box of tissues later in the year. Be sure to check out the Classroom Direct Deals page for the latest savings items. The gesture could go a long way to add some positivity to another person's life. 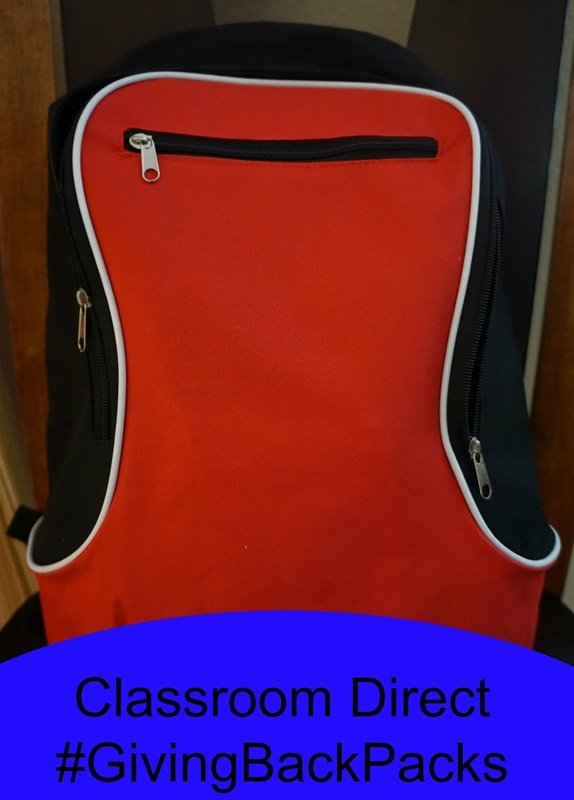 Disclosure: Classroom Direct provided the writer a backpack to give to the charity of her choice. This is wonderful, and I really appreciate you saying that it's a need that continues into the year. Teachers will appreciate that greatly! I am so glad you shared this information. We have been looking for a place to donate some school supplies. I am glad that classroom direct works to help out kids who need supplies. This is wonderful. Back to school is expensive for most families, including mine. I feel blessed that I have never had to choose between providing supplies and providing food. I get so sad to know that kids need supplies and cannot always afford them. This sounds like a really good program to help out. Paying it forward is the best feeling, too! I love it when companies give back like this! We have several programs in our area to help with school supplies, but they always run out. With the recession it can be hard for parents to cover even some of the basic stuff so I am glad that we have several programs in our area that are helping kids have a successful back to school. I love when companies give to those in need. Back to school can be an expensive time for a family.